Bern’s Steakhouse: What’s the Big Deal? 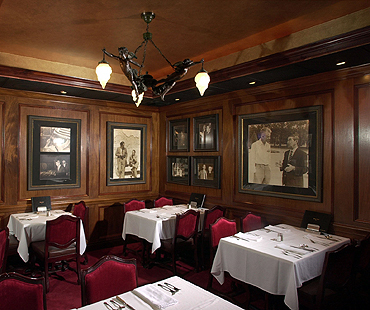 As far as fine dining goes, Bern’s Steakhouse is supposedly the quintessential example of a culinary experience in Tampa. It is, and has been for decades, a legend among local residents as well as foodies across the country. A famous name frequented by all the famous names, Bern’s is a restaurant that everyone knows, but not everyone has experienced. It’s not that Bern’s is exclusive. Making a reservation is easy as calling a few days in advance. And contrary to popular belief, you don’t have to be formally fancy, excessively rich or extremely knowledgeable of fine wines to make it past the velvet ropes. It’s no T.G.I. Fridays, but it’s hardly members only. A self-admitted skeptic, I went to find out. First arriving at Bern’s, I wasn’t at all awestruck. For years I’d been driving past those windowless, white cinder-block walls, wondering what sort of exclusivity I was being denied by being on the outside. But inside, it hardly felt elitist. It felt historic. Gothic in its dark lighting and velvet, the interior of Bern’s was regal but warm – not intimidating posh – just strangely, yet appropriately aged. Bern’s didn’t feel foreign because it felt formal, it felt so because it was so obviously opposite of the modern restaurants I’m used to. This wasn’t an overtly classy experience, it was classic. WINE – Wine choices as Bern’s are presented in a hard-bound, epic wine anthology – complete with a table of contents, listing hundreds and hundreds of wines and champagnes from around the world, ranging from $30 to $1,000. It’s daunting, but it doesn’t have to be. Unless you are a wine connoisseur, you can simply order one of the cheaper selections. My table ordered a less expensive Cabernet from California that none of us had ever heard of, and it was still fabulous and about $40. DINNER – Ordering dinner at Bern’s is somewhat different than choosing the number of a value meal. The menu is 18 pages (which offers a variety of other entrees and a long list of caviar) and lists seven different cuts of steak with descriptions and preparation suggestions. Steaks are ordered to a desired “doneness,” thickness, weight, and cut and include soup, salad, baked potato, vegetables and onion rings. The food courses arrive like the uphill of a rollercoaster ride. Perfect French Onion Soup in a gooey cheese covered shell then a tossed salad adorned with almost a dozen different vegetables that taste so fresh, crisp and clean, eating them feels like entering a different realm of the food pyramid. And at the top of the ride, the prettiest steak you’ve ever seen. Take a bite and hold on for the ride. The steaks, ordered to a chosen thickness because the meat is trimmed and cut fresh for each individual order, are aged 5 – 8 weeks, (because like fine wine, quality beef gets better with age) and broiled over real charcoal. They aren’t bloody, even if they’re rare. They bare no unsightly gristle or fat and literally melt in your mouth. The first bite can incite an epiphany. Mine: Bern’s isn’t what it’s cracked up to be… it’s better. And the proof isn’t in the name, the ambiance, or the high-end appeal, it’s in the food. Bern’s isn’t designer food – flashy and excessive for the sake of being expensive. It is simple, quality food that requires a higher price tag simply to cover the cost of its greatness. When the bill arrived at the end of the evening, about $150 for dinner for two, I didn’t feel cheated. It was more than worth it. DESSERT – Sometime during my short-lived love affair with a filet mignon, a call was made. The waiter discreetly picked an antiquated landline phone from the wall and appeared to call in a hit. And he might as well have. The table reservation in the Bern’s Dessert Room was almost the end of me. The desserts at Bern’s are so spectacular and plentiful that they require, not their own menu, their own floor of the building. 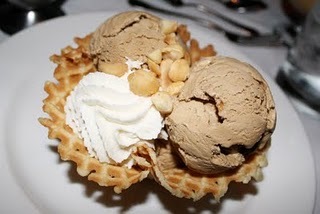 The Harry Waugh Dessert Room is basically a restaurant separate from Bern’s – catering to patrons of the dining room and when possible, walk-ins looking for the dessert only section. The Dessert Room feels like it belongs in a different era – a time when dining out was an event and a privilege. The booths, which are more like small rooms, are seductively intimate and private. Tall wood panels surround tables in secluded alcoves where it is impossible not to feel secretively elite – but still basic and humble. The menu lists dozens of Dessert Specialties, sundaes, sorbets, and ice creams that are made in-house, as well as coffees, espressos and dessert wines. It’s an unbelievably difficult task to choose just one, so relying heavily on the advice of the server I ordered The Macadamia Nut Sundae. The menu listed it as “The Best Sundae in the World” and the server advised that chefs have been perfecting the recipe for over seven years. Again, Bern’s lived up the hype. A crunchy waffle cone base filled with three heaping scoops of smooth homemade Macadamia Nut-flavor infused ice cream, whipped cream, nuts and hot fudge – this was no ordinary sundae, it was a finely-crafted work of art. It really was the Best Sundae in the World. So, what’s the big deal with Bern’s? Everything. It was well worth the extra expense, the planning, and the step out of my comfort zone. The dining experience was more than a meal – it was an education on quality, class, authenticity, and of course, food. I entered Bern’s a skeptic and exited an advocate. I’m already planning my next trip back. I suggest you do the same. fine “dinning”? assume you meant dining, but either way, you’re right: Bern’s is a classic dining experience no one should miss if they’re spending some time in the Tampa Bay area. I absolutely love it! You forgot one of their least talked about items but it changed the way I forever choose a certain product: Coffee. The coffee was simply amazing and it prompted my brother-in-law to buy his own roaster to try and replicate the taste. They will even sell you a pound of beans for about $13 if you ask (it’s not on the menu).